Bed screen tracks shall be Mactrac Pro Plus (SC3) 38mm x 20mm bed screen track system, complete with the necessary fittings and components, fixed in strict accordance with the manufacturer's printed instructions, by approved installers. The complete system shall have a (colour) powdercoat / (colour) anodised finish. All holes and cavities shall be vermin proofed after installation. The glides shall be Mactrac (name) installed to every 100mm of track length in addition to hooks at fixed ends. (38mm x 20mm) aluminium track profile. 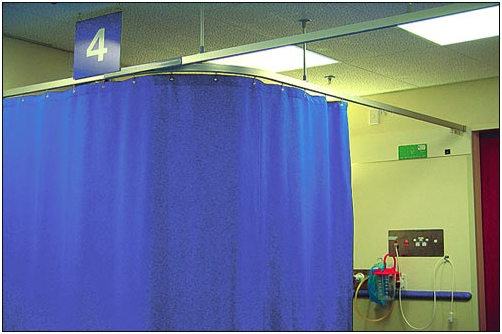 Mactrac Pro Plus is used predominantly for hospital bed screens, doctors' surgeries, rest homes, showers, changing rooms and other such areas.